Happy Groundhog Day. Happy Groundhog Day. Happy Groundhog Day. I was just reading about the history of Groundhog Day because I have long been a fan of the husky little marmots. They’re not common where I grew up in the prairies. There, I was much more likely to see ye old woodchuck’s smaller and somehow more pesky cousin, the gopher. And I like them too. But they’re not quite cool enough to get their own day. In the mid 2000s I was visiting my friend in Ottawa. It was late spring and as we walked near the National Gallery, mommy groundhogs and even cuter baby groundhogs dotted the lawn. My excitement at seeing them was definitely as high as my excitement at seeing Parliament for the first time. In fact, I held more reverence for the little furlings than I did (do) for any politician. I tried my damnedest to pet one, which my friend found hilarious. Predictably, most of them immediately scurried away in fear, while others first took a little run-step towards me with teeth bared. I got the warning, but I still think they’re adorable. A couple years later when my husband and I moved to Ottawa, groundhog sightings were a regular thing, but the thrill didn’t wane. I was working a job I despised that required a 45 minute meandering bus ride through the city. The highlight for me was passing through the Carleton University campus, where it would seem groundhogs outnumbered students 2-1. I would count them, and if I spotted 10 or more I’d take it as a sign that my workday would be somehow bearable. I have no idea why I decided groundhogs would be my talisman of workplace fulfillment, but sometimes it seemed to work. Maybe if I carried around one of their little paws, like a lucky rabbit’s foot, I would’ve won the lottery by now. But I could never commit groundhog-icide. My incomplete and non-extensive research into Groundhog Day has taught me that its history is tied both to German weather lore and the Celtic festival of Imbolc or St. Brigid’s Day. A-ha! Loving the groundhog and the day in his honour is born in my very own German-Irish blood. Actually, I suppose weather prognosticating really is in my blood to some degree because my Dad once dreamed of being a meteorologist and is probably the most enthusiastic weather watcher I know. 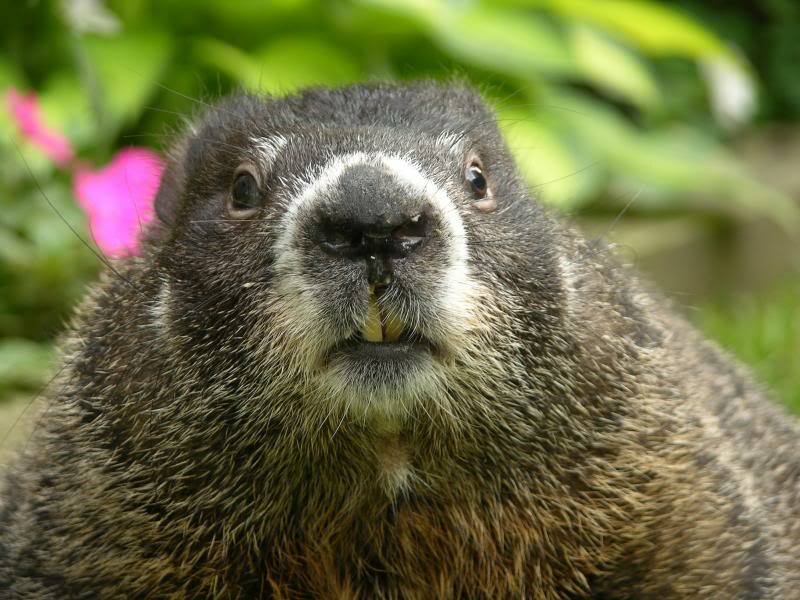 The Germans of Pennsylvania considered the tradition of groundhog weather prediction important enough to make it a regular thing starting in the mid 1800s. I guess we saw all the fun going on south of the border and decided to celebrate Groundhog Day with our own furry weather men. In Canada, the celebrity groundhogs are Wiarton Willie (Ontario) and his less-famous brethren Shubenacadie Sam (Nova Scotia), Brandon Bob (Manitoba) and Balzac Billy (from my neck of the woods in Alberta). They all live in protective custody, so to speak, and are reluctantly nudged from their winter slumber to pop up every February 2 and look for shadows. Whether they see them or not is fairly moot up in these parts, because we always have winter for 6 more weeks. Usually 10 more weeks. So, Happy Groundhog Day to you, whether you’re in the grips of winter (and will be until April) or you’re basking in a long hot Australian summer (like my snow-allergic sister). And if you get caught in some do-over time loop, just say a prayer to the pagan goddess Brigid, or shut your eyes and count groundhogs the way you count sheep to go to sleep. I heard counting them brings good luck.